while breakers curl and pound here. I feel it in my bones! A stormy night at sea has uncovered some long-buried secrets and surprises. Is that the mast of a shipwreck? A faded pirate hat? And what’s that hiding in the sand? A mandible and a clavicle, phalanges and femurs, a tibia and a fibula — could there be a set of bones scattered across the ocean floor? And who might they belong to? A jaunty rhyme takes readers on an underwater scavenger hunt as a comical skeleton tries to put itself back together piece by piece. Make no bones about it: this rollicking read-aloud will have young ones learning anatomy without even realizing it. 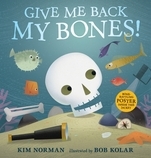 A silly pirate skeleton seeks to put its bones back together in this rhyming romp beneath the waves. Kim Norman is an artist, actress, and singer as well as the author of children’s books such as Puddle Pug and The Bot That Scott Built. Give Me Back My Bones! is her first book with Candlewick Press. She lives in Virginia. Bob Kolar is the author-illustrator of many books, including Big Kicks. He is also the illustrator of Nothing Like a Puffin by Sue Soltis, the AlphaOops books by Alethea Kontis, and Slickety Quick: Poems about Sharks by Skila Brown. Bob Kolar lives in Missouri.